A down week on all three indexes. The Corporate & Community Site Index delivered the biggest news of the week, dropping a shocking 38 points as Sniffapalooza cratered 63% to its lowest level since the CCSI began in August 2009. 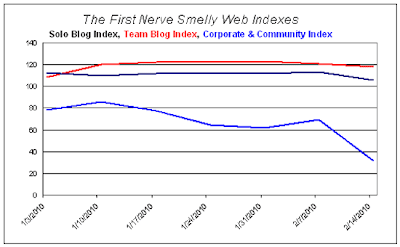 [According to our pre-index records this is Sniffapalooza’s lowest Alexa ranking since January 2009.] Is something going on or will the site bounce back next week? Stay tuned. The Solo Blog Index shed 7 points on a steep decline at JaimeleParfum and an 18% drop at GlassPetalSmoke which follows last week’s 26% drop at that site. Tuileries gets an asterisk because it literally fell off the charts: below ~24 million Alexa no longer provides a numeric ranking. This data quality issue puts Tuileries at risk of delisting from the SBI. Since the site has encountered rock-bottom levels before and recovered, Tulieries gets a reprieve; this week we substituted its previous lowest ranking which pegs this week’s performance at -12%. Finally, the Team Blog Index lost 3 points, continuing a downward drift from last week. The Sniffapalooza people tell me their traffic hasn’t plunged—in fact it’s better than ever according to their stats. This may be one of those inexplicable rank changes that seem to happen periodically with Alexa. We’ll see.